Description: INRD's first northbound move via its new trackage rights on the CSX to Chicago. It looked like the last call for any CP power wanting to go north on this, the first day of INRD operations of its new "Chicago Sub" (former CP Latta Sub). Check out that power consist! Description: CP #588 comes into La Crosse behind an vintage ex-Milwaukee Road GP40 - sweet! Description: Having tacked the 2 gondolas filled with scrap metal onto the end, the crew on this bandit-led wayfreight (CP 592) is up to 6 cars and on the move south. Description: Special Photographer Philipp and Frank. Description: On the Dresser Turn again. Description: CP 287 with the SOO2032 leading passes the La Crosse Roadswitch power with the SOO2041. Description: La Crosse Roadswitch power. Description: The bandit trails the 6 unit consist today on the colorful 496. 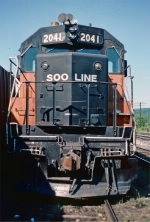 Description: SOO 2041 awaits her turn to see the doctor at CP's St Paul yard. Description: CP's display for Railfair 2008. Description: Still doing the the builders intended - making money for the carrier! Ex-Milwaukee Road GP40. Description: The tired 2041, one of the few Bandits left unpainted. With three Geeps done within the last few weeks, this may be my last time seeing this one. Description: This old bandit sits outside of the diesel shops. The 2041 has seen better days. Description: The crew of transfer one is getting ready to perform a drop of the three cars so the conductor won't have to ride the shove back to Lexington Ave. Turns out that the drop didn't work, and they did have to have the conductor ride the shove back. Description: Is this a final good bye? With all the bandits getting repainted, it was great to see two bandits at New Brighton and on transfer one too! This is one for the books. Description: Its also been awhile since a bandit was seen around this area. NEAT! Description: With the bandit 40 leading, H27 blasts through Saint Paul Park on its way down the river. Description: Ex Milwaukee Road Geep leads an idler car and an ethanol train up Great Northern Hill. All these years after SOO and CP merged you'd think this GP-40 might get painted.